The kids got out of school early today, so we decided to head over to the Getty Museum. 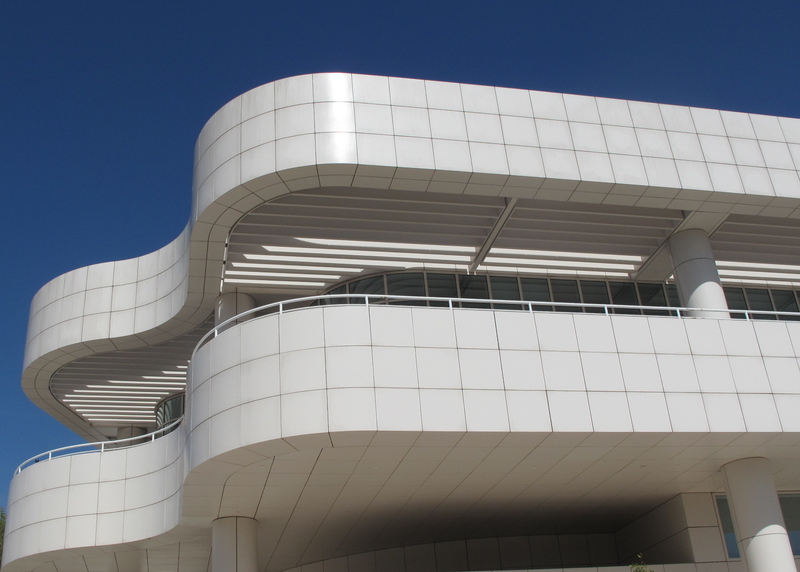 The museum’s travertine-clad building, designed by architect Richard Meier, sits high on a hill above the city of Los Angeles. We parked at the bottom of the hill and took the tram to the museum plaza. The kids loved the driverless tram, which floats up the hill on a cushion of air, guided by electric magnetic strips — no train tracks here. I enjoyed the panoramic city views. At the museum, we headed straight for the Family Room, a great place for kids and parents to explore (learn more). The Family Room is filled with creative interactive play areas and art-making activities. When my boys were toddlers, they couldn’t get enough of the Family Room activities. I took this picture of them (above) in the Family Room when they were only 2 & 4 years old. Now that they’re 6 & 8 years old (photo above), I wasn’t sure they’d have the same enthusiasm — the Family Room is probably best suited for children 6 years and under. But both boys dove right in. Just like before, they had a blast recreating the museum’s outdoor wire sculpture, by artist Martin Puryear (learn more), using long foam tubes. They colored carnival masks like the ones they saw depicted in a copy of a James Ensor painting (learn more). When I gave school tours at the Getty, children always responded to this large and colorful oil painting, so be sure to checkout the real thing in the galleries after you visit the Family Room. After they finished their masks, the kids started copying illuminated manuscript calligraphy from the Middle Ages. Another family read a book on a replica of an over-the-top 18th century French bed (learn more) from the Getty’s Decorative Arts collection. Moving outside, we walked toward the galleries to try the Art Detective activity cards we picked up at the Family Room. But my kids quickly got distracted — they saw the Central Garden and wanted to play on the lawn. Even on an early, cold Spring day, the garden was so enticing. We decided to take a quick stroll through the garden. On our way, we passed a huge water feature created by the garden’s designer Robert Irwin. My 6 yr old stopped and shouted “Wow” as he took in the sheer size of it. We’d like to come back another day and see more of the Central Garden, a living work of art. Maybe a picnic when the garden’s flowers are in full bloom, and the trees are teaming with fresh new leaves. Stay tuned for my next post about the Getty Museum’s Art Detective Cards.